It’s the Astro Oscars: where we let the stars pick the stars who win! Ladies and gentlemen, members of the Academy, and ordinary pundits, fans and filmgoers out there who would just like to know—we are about to unveil this year’s ASTRO OSCARS winner for Best Picture of the Year. This has not been an easy one to discern. The methodology I have used has not been the accumulation of various awards, personal popularity or arcane industry statistics, but rather the celestial planetary patterns that give us clues as to the actual energy at hand. To that end, let’s first review the chart of the Oscars ceremony on Sunday, February 24th. The Sun, in Pisces, is just setting on the 7th House cusp of relationships, emphasizing the give-and-take, I-and-thou nature of the nominated pictures. Just beneath the horizon, but close to the Sun, is Neptune, whose energy speaks about creativity, compassion and spirituality, but also emotional confusion and trouble with boundaries. The key-like symbol for Chiron, associated with woundedness, sits close to the Sun on its other side. We can immediately see that there aren’t a lot of feel-good movies being depicted here. There’s a lot of pain in this chart. With Mars (willpower/ego) and Mercury (intelligence/communications) also residing in the 7th House, this is going to be either a very cooperative show or else somebody’s ego flies completely out of whack. Uranus, planet of shocks, sits in the 8th House making an adaptation angle to the chart’s Ascendant at 4 degrees Virgo. This looks like at least one major upset or surprise. Pluto (obsessions) sits in a loose trine (flowing angle) to the Ascendant from the 5th House of creativity. This is another indication of hidden power issues at work. We must also pay attention to Jupiter (expansiveness/generosity/philosophy) sitting right near the Midheaven, the topmost angle in the chart and the point of reputation. This looks like an epic or expansive theme will win. Jupiter also rules long distance travel and also law, both of which figure in several of the nominated films. And Saturn, giver of earned rewards, sits in Scorpio in the 3rd House of communications. Expect a long show once again, with our patience being tested but rewarded. And now, to our question: What film fits this energy pattern best? The one that does will win Best Picture. We have several relationship movies, several with foreign travel, several with themes of rescue or of dealing with secrets, several which espouse philosophy and several with legal themes. How are we to discern the winner? Well, let’s go through the list and look at each film’s release date—which is, in a way, the “birthday” of the film’s run. Do we see a particular film and its date of release that fits comfortably with the energy pattern of the Oscars ceremony? The earliest date is for the foreign film Amour, which was released in the U.S. on May 20th. That was also the date of a big Solar Eclipse at zero degrees Gemini. Eclipses have a powerful effect, and this was a New Moon, a potent seed point, so it’s no surprise that a film released then was nominated for several Academy Awards. That’s also right at the top of the Oscars chart, but then there’s that hard square to Neptune (creativity), which blocks its path. It’s poignant and wonderful, but Amour will not win Best Picture. Beasts of the Southern Wild was released on June 27th, making it a Sun-sign Cancer. But other than its 8-year-old star, the hard angles to Uranus (surprises) and Pluto (power) in the Oscars chart give the film a tough journey to creative recognition. Despite all its magical realism, I’m afraid that this Beast won’t be in the hunt for Oscar. The bloody Django Unchained was released on Christmas Day (Quentin Tarantino makes a joke of these things) and is therefore a Sun-sign Capricorn. It does fit the theme of personal confinement—it’s about slavery, after all—but other than a nice angle to the Sun in the Oscars chart, there is little energetic connection. This spaghetti Western will not dine at the trough on Oscar night. The same goes for the tuneful Les Miserables, despite the star power of Hugh Jackman and the probable win for Anne Hathaway. While the suffering and ultimate redemption of the human heart does fit the Neptunian theme, other energies have dictated that it needs more than singing to win this year. Les Miz must be content to have stated its theme so fully. Life of Pi is an extraordinary journey, literally and figuratively, befitting that horizon-seeking Jupiter at the top of the Oscars chart. It’s philosophical and takes place on the ocean, astrologically given both to Pisces and to the 12th House. It was also released on November 21st, when the Moon was crossing through Pisces. So Pi almost precisely fits a great deal of the energy in the Oscars chart. Is it enough to win? I wouldn’t be surprised if it does. But the late Scorpio release date sits in a hard angle to the Leo Moon on Oscar night, so as much as I adored the film, I think its chances are iffy. Zero Dark Thirty almost hits a bullseye when it comes to corresponding to the Oscars chart, which is fitting because it depicts “the greatest manhunt in history.” Released on December 19th, making it a Sagittarius, the film has not only got themes of “us vs. them” (Oscars Sun on the 7th House cusp), it is a story about finding a hidden leader (Oscars Moon in Leo in the 12th House). 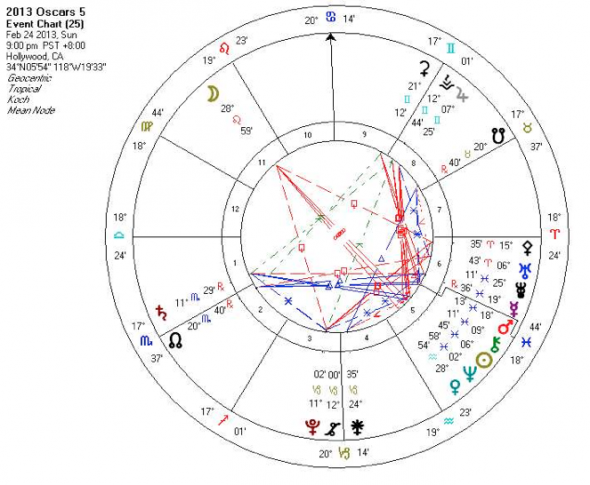 It involves foreign intrigue and long distance travel (prominent Jupiter in the Oscars chart), and a technology-aided raid that ends in blood (Uranus in the 8th house). If you feel like gambling, here’s your bet. At least according to the astrology, this film’s got a real shot at winning. But from here on in, it’s basically a crapshoot. Even Yours Truly, a professional astrologer for over 30 years, finds this year to be extraordinarily confusing. I probably should just punt the ball and say, “Well, somebody’s gonna win!” But as it’s my professional duty to pick the winner, we’ll do the best we can. 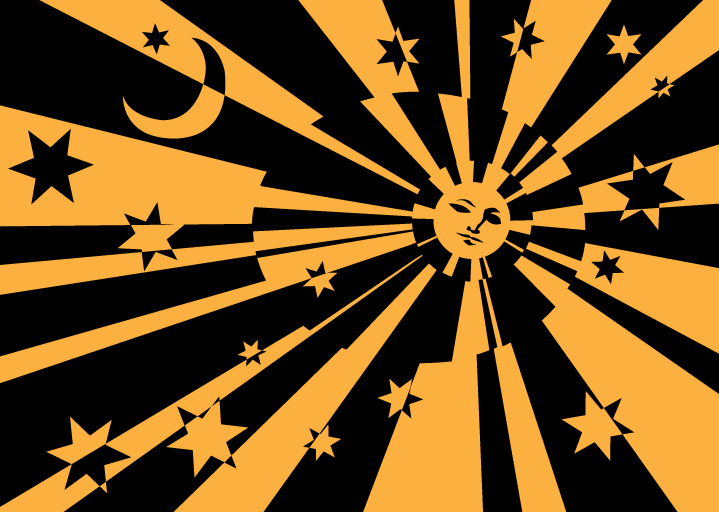 Argo was released on October 12th, making it a Sun-sign Libra, the sign associated with diplomacy. The Oscars Sun is in the 7th House, given in astrology to Libra. Ben Affleck’s Sun-sign is Leo, which is where the Moon resides on Oscar night. The film has been cleaning up virtually every award for which it’s been nominated. So it’s the smart pick to win Best Picture. But the model we’ve been using, release dates and comparison to the Oscars chart, doesn’t do much for Argo. There’s Oscars’ Moon in the 12th House (behind-the-scenes activities), and Jupiter at the top can refer to foreign intrigue, but it’s more jovial than the general tone of nail-biting Argo. The massive grouping of planets in the Oscars chart’s 7th House of relationships doesn’t quite fit, either. Affleck was of course snubbed in the Best Director category, and you could take the view that all of these awards are a populist revolt against the snooty Academy. After all, almost no movies have won Best Picture without its director being nominated. So let’s look at Affleck’s chart and see what we can see. Ben’s a Sun-sign Leo, and remember that the Moon is passing through late Leo on Oscar night, so he’s definitely pumped. His natal Moon’s in early Scorpio, and Neptune (dreams/film) is making a lovely flowing trine to it now. That’s a good sign. Affleck’s also gotten a lot of mileage out of that snub, which occurred in mid-January as Uranus (shocking events) made a hard square to his Venus/Ascendant conjunction (love/arts/self-image). 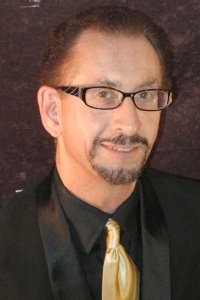 With Pluto (power issues) sitting on the opposite 7th House cusp, people took umbrage at the snub and boosted his reputation by throwing all kinds of awards at him. Will he grab the Best Picture Oscar, too? 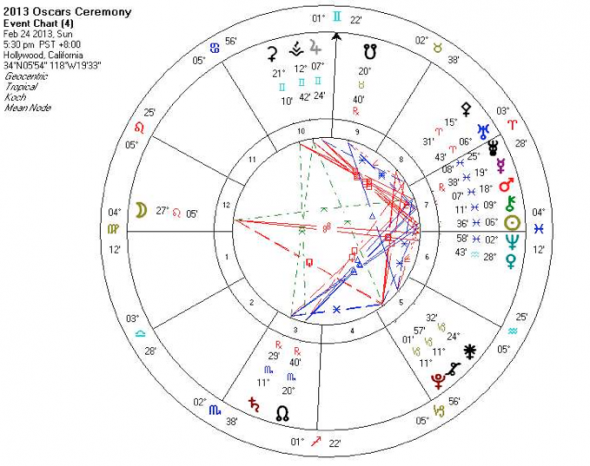 It’s true that Mars (willpower/conflict) is within a degree of his Midheaven (point of reputation) on Oscar night, with retrograde Mercury right there, too. But Mercury retrograde is famous for its disappointments and both planets sit in an exact square to Saturn (hard knocks), located in the 12th House of past karma. Saturn has also just turned retrograde in a hard square to Affleck’s natal Mercury in Leo. So, despite all the hype, it’s tough to see a win here. 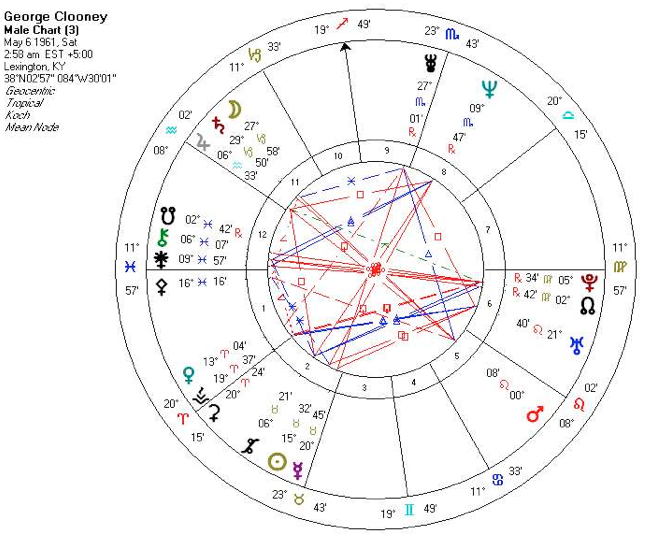 With 11 degrees Pisces rising, Clooney is well-set-up by the cosmos right now. Saturn (accomplishments) sits in a sextile (opportunity angle) from 11 degrees Capricorn to that Pisces Ascendant, and Pluto (empowerment/transformation) is making an exact flowing trine to the Ascendant (self-image). This indeed looks like a win. Additionally, Uranus (liberation) sits in a opportunistic sextile to Jupiter (good fortune). But on Oscar night, retrograde Mercury (difficult communications) and Mars (conflict) make a harsh square to Clooney’s Midheaven (point of reputation). Neptune (creativity/spirituality) also sits right on his South Node (point of karma), which could add some confusion to the mix. In short, Clooney’s chart shows a possible win, but we also see snafus. Affleck’s chart shows disappointment. So will Argo win? It’s not a cosmic certainty. And now we come to the delightful Silver Linings Playbook, a bona fide hit about a tough subject—mental illness. This film perfectly fits the Oscars chart in several ways: first, that big stellium (grouping of planets) in the 7th House of one-on-one relationships, which speaks to the vigorous, wounded and often angry exchanges between the lead actors…who end up a couple. Then there’s the Oscars Moon in Leo (grand emotions) in the 12th House of illness and hospitalization. And don’t forget the Sun-Neptune conjunction—Neptune rules medications. 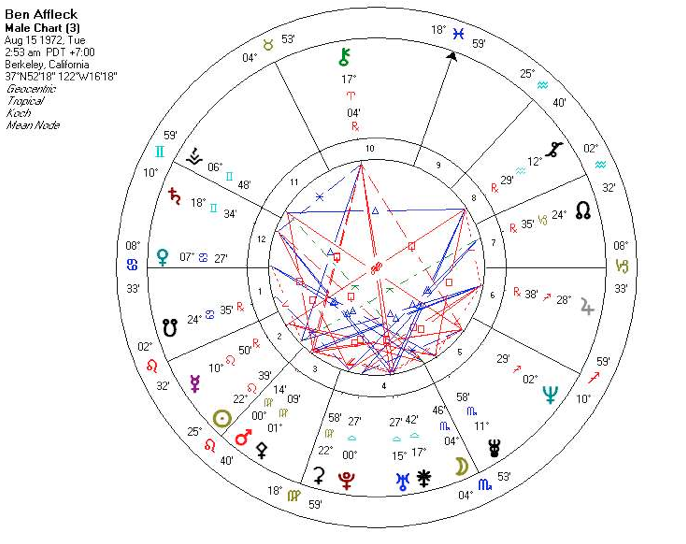 The only thing in the Oscars chart that doesn’t really fit is that prominent Jupiter (philosophy) at the Midheaven. But Jupiter also rules optimism, and Bradley Cooper’s character IS looking for a “silver lining.” Add to this rumors of a groundswell of support for the film and yes, it’s entirely possible for Silver Linings to win. There will be a lot of Neptunian tears on the stage and in the audience if it does. For my money, though, the film that fits the Oscars chart best, even though it’s being discounted as having been bypassed in the voting, is Lincoln. First of all, it’s an epic, which fits the Oscars chart’s Jupiter at the Midheaven. Jupiter is about morality, kindness and sometimes legalities—all of which play a part in the film. The Oscars’ Sun-Neptune conjunction is about compassion, made personal by it straddling the 7th House cusp of relationships. Tommy Lee Jones’s character actually marries a slave. But since I have to declare ONE winner instead of two—I’m still thinkin’ Lincoln. Honest Abe is my man. We’ll find out Oscar night if he feels the same way about me. Good luck to us both! To paraphrase the movie: Sweat has been spilt to afford us this moment—now, now, NOW!